Modifications to the Northern Hinterland enclosure system that began at the end of Period 3 are followed-through in Period 4 (Figure 163). Activity within this landscape seems to become increasingly varied. With the perpetuation of the major north-south boundary (ditches 25273/25274 and 25103/25105) across the investigated part of the Northern Hinterland, it is assumed that the expansive fields represented by OAs 39 and 40 survive. However, the area of OA40 is effectively reduced with the insertion of a square sub-enclosure - OA54 - in its south-west corner and, in view of this, OA40 is hereafter referred to as OA55. Within OA55, crop-processing structures - presumably drying floors - are positioned either side of the recently formed gap in the boundary with OA39. Their introduction may suggest a degree of intensification of cereal cultivation, or at least a rationalisation of practice with at least some processing now being conducted in the fields in order to reduce bulk and effort of haulage before transfer into the settlement. Conversely, the creation of square enclosure OA54, with its funnelling entrance at its south-east corner, possibly indicates a function as a paddock or corral and might suggest increasing pastoralism at the same time. Scattered pitting continues at the southern peripheries of the Northern Hinterland (OAs 37 and 38), but is now supplemented by production activity in the form of a pair of pottery kilns. The retention and modification of the enclosure system is first considered below, followed by description of the content of each constituent Open Area. Later Period 4 changes are covered in 'Northern hinterland west of Road 1'. The Late Iron Age enclosure system is largely maintained throughout the early Roman period and into Period 4. As described in 'Northern hinterland, modifications to the enclosure system (west of Road 1)' ditches 25103 and 25105 constitute the maintenance or re-instatement of the major north-south boundary 25199 around the mid-2nd century. This re-established boundary survives in Period 4. More significant modifications are made around the beginning of the 3rd century AD when a rectangular enclosure (OA54), c. 55m by 45m, is inserted into the corner of the existing ditch system defining OA53. The lines of former ditches 25199 and 25194 are re-cut to form the south and west sides, while the north and east sides to this new enclosure are marked by the creation of ditches 25198 (segs 2306, 2365, 2431 Group 896), 25104 and 25193 (segs 2225, 2262, 2287, 2394 and 2159, 2161, 2168, 2902 Group 895). Both re-cut and newly established boundary ditches are uniformly slight, generally surviving to around 1.0m wide and 0.25m deep. There is no trace of structural remains, such as a palisade, within these and it is perhaps as likely that they simply represent bedding trenches for hedges. All of the ditches are re-cut at some point, and some parts continue to receive fills until the Late Roman period, but the nature of the filling suggests it is unlikely that the whole ditch system continues to function (as open ditches) for this long. This may again argue for their lines being maintained and perpetuated as hedgerows. 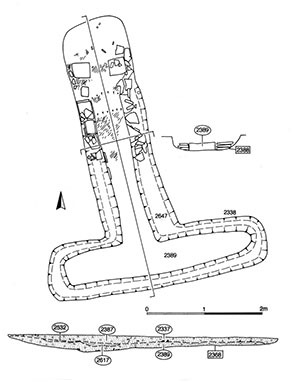 The principal entrance appears to be located at the south-east corner of the enclosure, where the southward continuation of ditch 25194 is retained in use and now augmented by the splayed projection of ditch 25193 to form a funnel-like arrangement. The splayed arm of ditch 25193 appears to terminate in a position corresponding with the line of re-cut ditch 25273 (Group 890 Period 3). As recorded in the field, the later re-cuts of 25273 do not appear to extend beyond this point, and the ditch is perhaps filled in to the west. However, it is more likely that 25273 is replaced in its entirety in Period 4 by an un-numbered and unrecognised feature in its top that is recorded on pre-excavation plans and is the same size as the ditches forming Open Area 54 and its splayed entrance. Activity resulting in the creation of intrusive features seems to be minimal within the newly created OA54 (Figure 163). Given its relatively small area and provision with a funnelling main entrance, it is likely that the new enclosure functions primarily as a livestock corral. 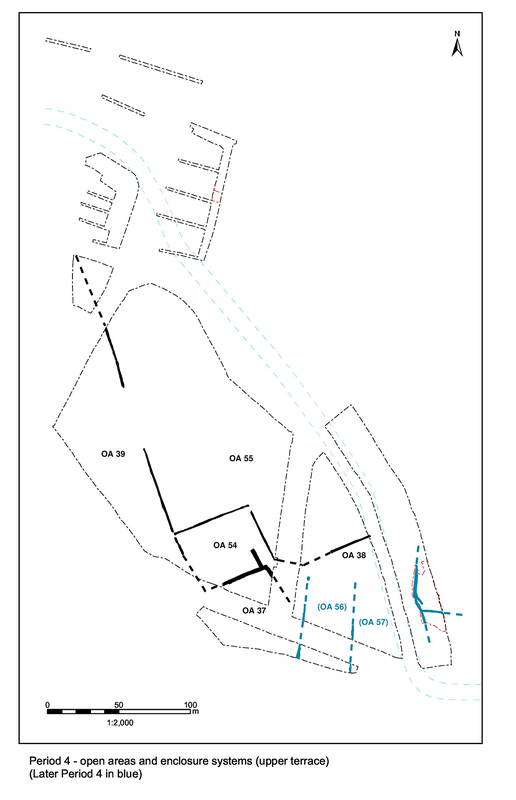 Just inside the entrance to Open Area 54 is an additional length of broad, shallow, ditch 25206 (seg. 2913), presumably associated with its funnelling function. Simpler, minor, entranceways are also located at the north-east and, possibly, north-west corners as defined by gaps between the various lengths of ditch re-cuts. The enclosure interior contains a number of post-holes, many of which form minor linear arrangements. Due to the paucity of dating evidence, their association with the enclosure can only be assumed. If correct, they probably represent animal pens, internal subdividing fences, or (less likely) a building. Structure 50, a c. 7m-long line of substantial and similarly proportioned post-holes 2157, 2186, 2227, 2247, 2268, 2868 (Group 931), runs orthogonal to the alignment of the OA54 boundaries. No other adjacent features appear to be related, and these posts probably form a short fenceline rather than one wall of a building. Only 2247 can be dated closer than simply 'Roman' and is no better than 2nd century or later. Pits 2178 and 2329 may also occupy OA54, but the dating of both (2178 is late 2nd/early 3rd century, 2329 is mid-2nd/mid-3rd century) means that either could potentially pre-date the formation of Open Area 54 in the early 3rd century. Both contain markedly small quantities of pottery and tile in comparison with mid-Roman pits elsewhere across the settlement. However, the central positioning of pit 2329 is noted. 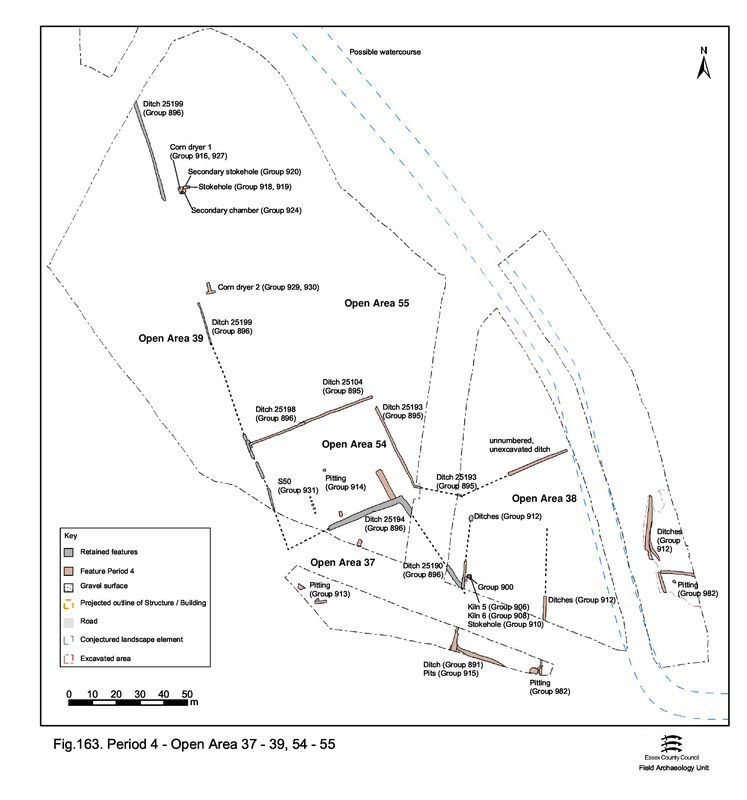 Open Area 38 is presumed to remain largely intact in Period 4, extending between re-cut ditch 25273 and the upper terrace edge Figure 163). A pair of pottery kilns is located alongside its western boundary. Sharing a single stoke-hole and being of broadly similar construction, they appear to be closely associated, perhaps functioning together, rather than one replacing the other. Both are Wattisfield-type (East Anglian), single-chambered, single-flued, kilns with integral 'bollard'-type pedestals (Swan 1984, 77, 115-16). However, the details of their individual construction and subsequent use seem to suggest they have separate, perhaps specialised functions. 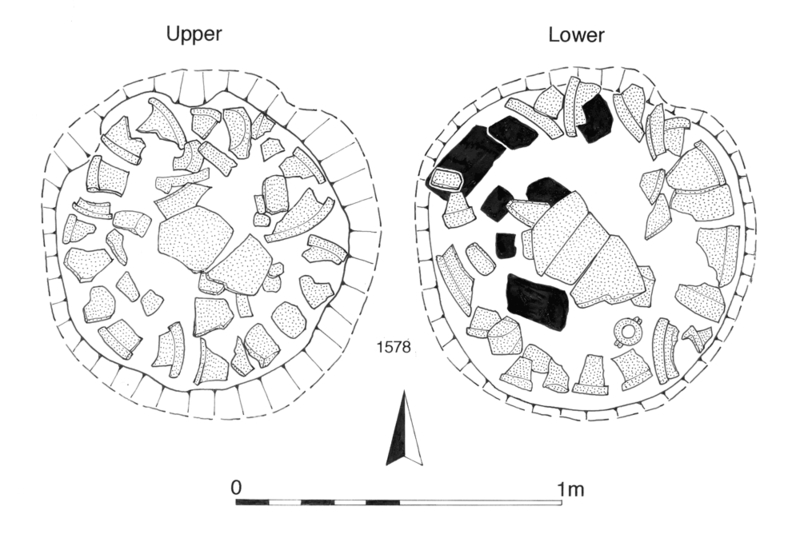 Kiln 1618 (Group 906) is a circular construction of 1.45m external diameter (1.35m internally) with remains of a short flue extending off to the NNE (Figure 173). The clay-lined chamber survives to a depth of 0.32m and contains a broad, low, integral bollard pedestal which, at 1.0m diameter, occupies most of the kiln floor. The flatness of the top of the pedestal and the lack of sockets or a ledge, for seating flooring bars, around the walls, indicate that the pots are stacked directly on its surface. This kiln displays some interesting detail, with its wall apparently constructed as free-standing within the cut before the void between them is backfilled with a fine sand silt. Wiping marks are evident on the internal wall surface, indicating it is smoothed during construction. The pedestal (1578) incorporates two layers of mortaria sherds and occasional large fired clay lumps, set in a radial pattern and packed with clay (Figure 174). The flue walls also include mortaria, particularly at the splayed cheeks of the flue entrance where large sherds are piled (up to six high) and also used as packing material behind (see 'The Late Iron Age and Roman Pottery'). 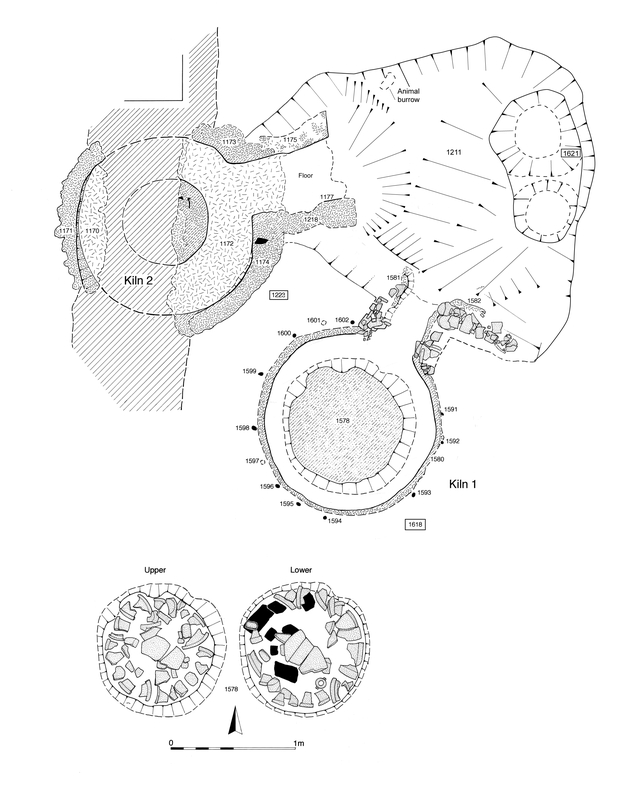 No evidence for repair or rebuilding of the kiln chamber is identified. Indeed, the kiln seems to be of a single build throughout, with no distinction between walls, floor or pedestal detected. However, there are signs of wear and tear to the flue walls and floor. Although the tops of the kiln walls are clearly truncated, there are indications about the nature of the superstructure above. The charred remains of twelve, possibly fourteen, stake-holes (1591 to 1602), averaging 0.07m diameter and 0.29m deep, are positioned at regular intervals around the edge of the kiln wall, having been inserted into the construction cut backfill. The charcoal-rich nature of their fills is presumably derived from the in situ charring of the thin poles during the kiln's use. These poles are presumed to provide the supporting framework for a domed clay superstructure. Few reliable use-deposits are identified within the kiln chamber and flue. Thin deposits of black, charcoal-rich silts cover the pedestal top and kiln floor. The majority of deposits infilling the structure are clearly related to its disuse (Group 907) and are generally orange-brown silts containing large quantities of distinctive fired vegetable-tempered clay fragments, which are almost certainly derived from the superstructure itself. It is speculated that the mortaria sherds deriving from this kiln indicates the production of this vessel form at Heybridge, though not necessarily in this particular structure, bead-and-flanged and hammer-headed forms (D3 and D11) being prevalent and bearing distinctive stamps that seem exclusive to Heybridge. A quantity of spalled and overfired greyware jar sherds, and possibly folded beaker, present in the kiln chamber and stoke-hole fills, are tentatively identified as kiln 1618 waste owing to the frequent presence of the forms and the homogeneity and good condition of the fabric. Cleaning layers 409, 1004 and 1501 (Group 937) over the top of the kiln have a relatively high degree of integrity and can be regarded as further collapse/destruction and disuse deposits. These contain a further large quantity of kiln debris material. 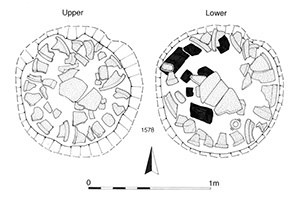 Kiln 1223 (Group 908) is a circular construction 1.60m external diameter (1.35m internally) with remains of a short flue extending off to the north-east (Figure 173). The kiln chamber survives to a depth of 0.2m. Much of the western and central area of the kiln is obliterated by later Period 4 ditch 25106, but part of a probably circular bollard pedestal survives. The pedestal is estimated to be of 0.75m diameter and 0.2m high. The chamber wall is substantially thicker than that of kiln 1618, at 0.1-0.2m wide. It incorporates large lumps of previously fired clay, within some of which are embedded greyware sherds and tile fragments. Unlike Kiln 1618, this structure does not purposely include pottery sherds as part of the fabric of its construction. The internal surface of the chamber wall is clearly vitrified, and the construction cut backfill behind it is scorched and reddened, indicating that intense heating of the structure has taken place. Intense or prolonged use is further suggested by evidence of repair to the flue floor. The pedestal was recorded in the field as being of two builds, a core and an outer layer, also interpreted as signs of repair. However, this is as likely to be the product of differential heating of a solid mass of clay which, admittedly, could been made in two stages. Although the kiln floor laps up against the chamber wall, this is merely a detail of the single sequence of kiln construction, rather than evidence of two phases of construction or repair. Use deposits of charcoal-rich fine silts are tentatively identified within the kiln chamber, thinning out towards the flue - perhaps as a result of their partial raking out in the final stages of the kiln's use. Above these are backfill deposits of brown sand-silts (Group 909) which, like the disuse deposits of kiln 1618, include large quantities of distinctive vegetable-tempered fired clay. There is little indication of what kiln 1223 produces. There are a very small number of spalled sherds, including mortaria and greyware. The latter is limited to body sherds. The absence of good evidence perhaps suggests that the kiln is regularly cleared of production waste. 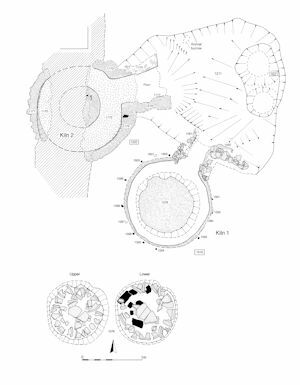 Irregularly shaped shallow stoke-hole 1589 is an integral feature of both the pottery kilns that open onto it (Figure 173). Probable constant reshaping of the cut during the course of stoking and raking out makes it impossible to determine if the feature served one then the other, or both simultaneously. Similarly, distinctions between deposits in the kiln flues and in the stoke-hole are difficult to perceive, with both use and disuse deposits tending to merge imperceptibly in the vicinity of the flue entrances. Cut 1589 itself is a broad shallow scoop, some 2.4m by 1.9m and 0.29m depth, into the underlying natural gravel and the fills of Period 2 ditch 25272. It is lined by charcoal-rich deposits derived from the raking out of the kilns, overlain by disuse deposits. Although generally darker, the latter fills are similar to those filling the two kiln chambers, being sand-silts containing distinctive fragments of baked vegetable-tempered clay and pottery sherds. However, the lowest of these disuse deposits, which extends into Kiln 1, is of greater clay content, perhaps indicative of a slow, natural wash accumulation within the abandoned feature prior to its destruction and infilling. Among the baked clay debris, fragments of at least four, possibly seven, fire-bars have been identified. While it is not clear if these are necessarily used in either of these kilns, this must be the simplest interpretation of their presence. Small pit 1621, located within the rear of the stoke-hole base, also includes a large fragment of mortarium. Filled with the same charcoal-rich material that lines the stoke-hole base, this pit appears to be contemporary with, even integral to, its use. The dating of the kilns, and therefore of the pottery manufacturing activity, is not particularly clear. The pottery incorporated into the structure of kiln 1618 indicates at the earliest a late 2nd century construction, borne out by the archaeomagnetic date of AD 140-170 for its last firing. Lacking diagnostic pottery in its structure, the construction date of kiln 1223 is more vague and not clarified by an archaeomagnetic date of AD 90-210. The use and disuse deposits from both kilns suggest early 3rd century dates, somewhat against the evidence of the archaeomagnetic dating. Kiln 1223 was cut by ditch 25106, which was probably also of early 3rd century date. It is concluded that the two kilns are at least broadly contemporary, functioning, if not constructed, at the same time. Further discussion of their use, particularly in relation to production, is presented in 'The Late Iron Age and Roman Pottery'. Mid-Roman period pitting appears to be sparse within OA38. Pits 3572 and 3574 (Group 982) occupy peripheral positions. Production waste deriving from Kilns 5 and 6 des not appear to be disposed of within the enclosure; indeed, it is notable that no substantial waster dumps are found anywhere within the excavated areas of the settlement. 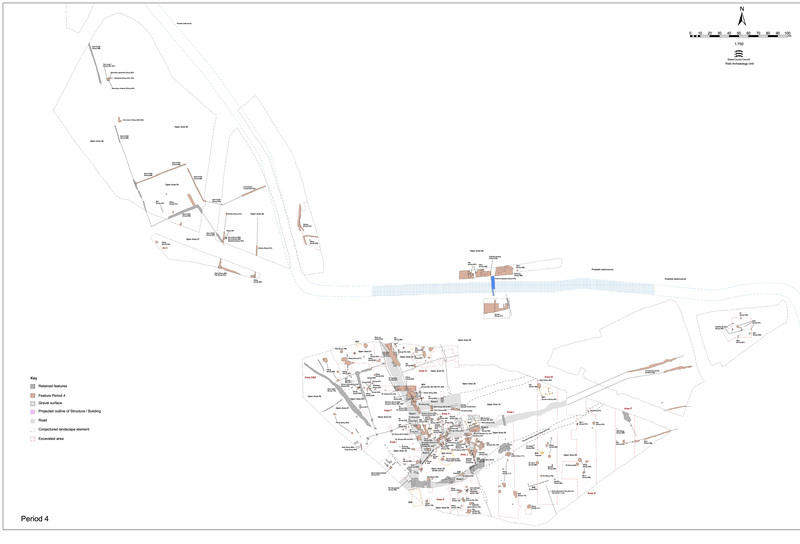 Other than the imposition of OA54 in its south-west corner, the land unit formerly referenced as OA40, is otherwise assumed to persist into the mid-Roman period (Figure 163). As described in 'Northern hinterland, modifications to the enclosure system (west of Road 1)', the late Period 3 re-affirmation of its western boundary and the creation of a gap in it provides a catalyst for further change in Period 4. 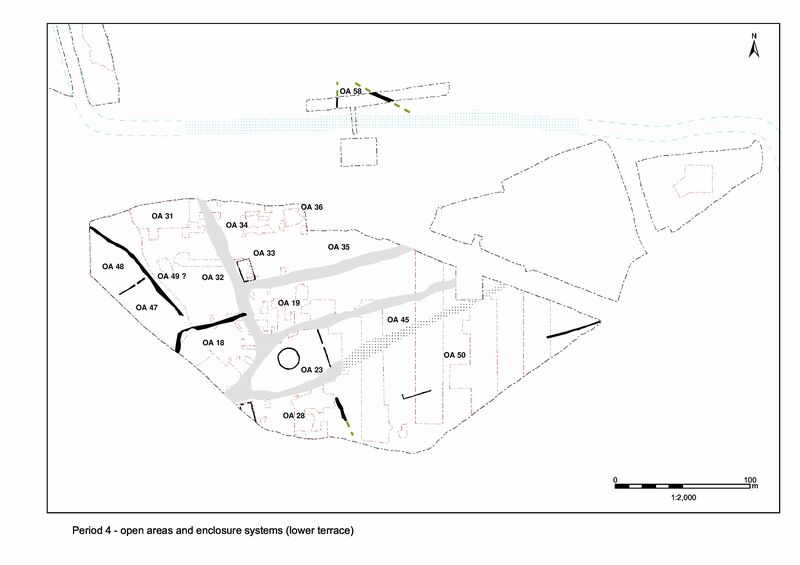 Positioned at either side of the wide entrance gap between Open Areas 37 and 53 are two likely drying-floor structures; though neither provided any firm evidence such as charred grain or diagnostic artefacts. Close parallels for one of these are to be found in corn dryers 4 and 5 at Foxholes Farm in Hertfordshire (Partridge 1989, 36-40). No other remains occupy the interior of this enclosure and its arable farming use is inferred. While the form of these structures differs, they are likely to be contemporary with one another and with the mid-Roman hinterland landscape, and to be used in the processing of crops gathered from the surrounding fields. Drying floor 3014 is the remains of a square foundation comprising under-floor vents or flues fed by an integral stoke-hole or fire pit. 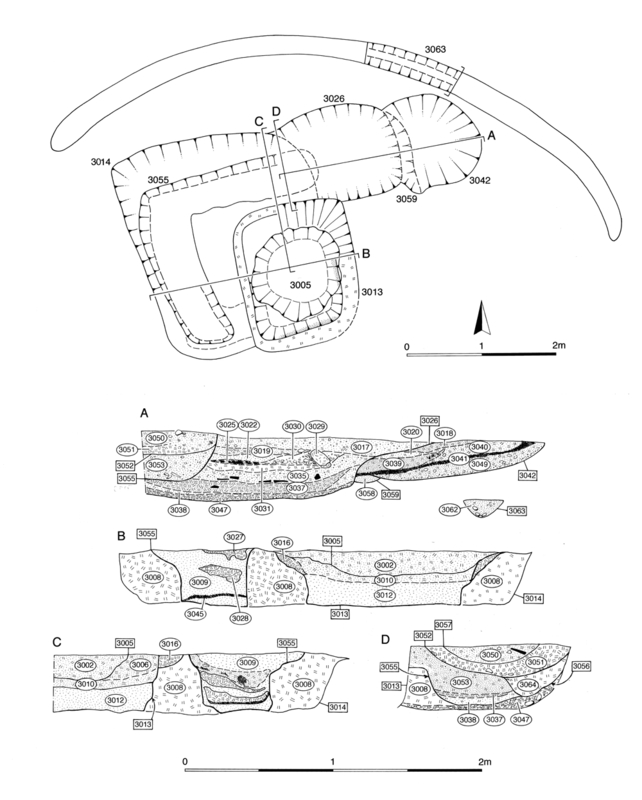 Two, possibly three, major phases of remodelling are identified (Figure 164). The below-ground structure of this feature (Group 916) occupies 3.0m-square and 0.4m-deep construction cut 3014; filled with a clean yellow-brown clay (3061) into which square-sectioned flue channel 3055/3052 is cut (NB: cut 3043 and its fills (Group 928) seem to be the result of double recording of the upper part of the flue channel 3055 sequence). The flue probably originally extended around three sides of the construction cut, though it is truncated by later features at either end, and presumably extends eastward, beyond the confines of 3014, to join the original stoke-hole 3059 (Group 917). Located approximately 1m from the north-east corner of the main structure, little of this first phase of the stoke-hole survives, being largely removed by replacement stoke-hole 3042 (Group 918). Only the very eastern edge survives, filled with scorched clays and silts (3058 Group 917). The replacement circular stoke-hole is 1.4m in diameter and again contains layers of silting, scorched clay and charcoal. On the surface of this build-up is a crushed, inverted dish (3048), overlain by fragments of orange fired clay lining, bearing wattle impressions (Group 919). The first phase of major alterations to the drying floor involves the repositioning of the stoke-hole closer to the main construction. 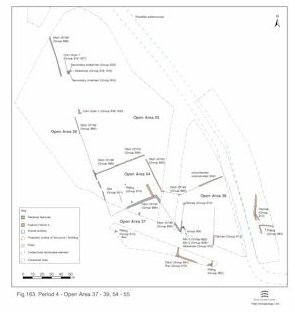 A new, sub-rectangular stoke-hole 3026 (Group 920) is cut to the east side of the old one, which has presumably become blocked-up. This necessitates the re-cutting and shortening of the flue (3056/3052/3057 Group 927), perhaps in order to increase its heating efficiency. The other end of the flue channel is also shortened, probably to make way for the insertion of rectangular, clay-lined, chamber 3013 (Group 924). The sides and base of this chamber are scorched and contain a sequence of charcoal, sand (the surface of which is vitrified) and further charcoal deposits, all apparently associated with its use. The morphology of this structure strongly suggests that it functions as some sort of drying floor, but evidence for an overlying superstructure is non-existent. It may be presumed that the flues and chamber are covered by a wooden floor, if not an enclosed structure. 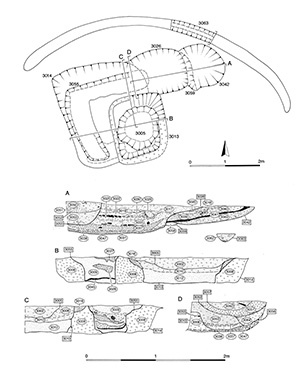 The only associated feature is arcing gully 3063 (Group 979) located to the north of the drying structure. This 9.1m length of shallow foundation gully or slot probably marks the position of a wind-break fence or else has a drainage function, possibly preventing water running downslope into the flues of the drying floor; the ground surface here slopes gently from north to south. Later disuse/re-use of this structure is described elsewhere. 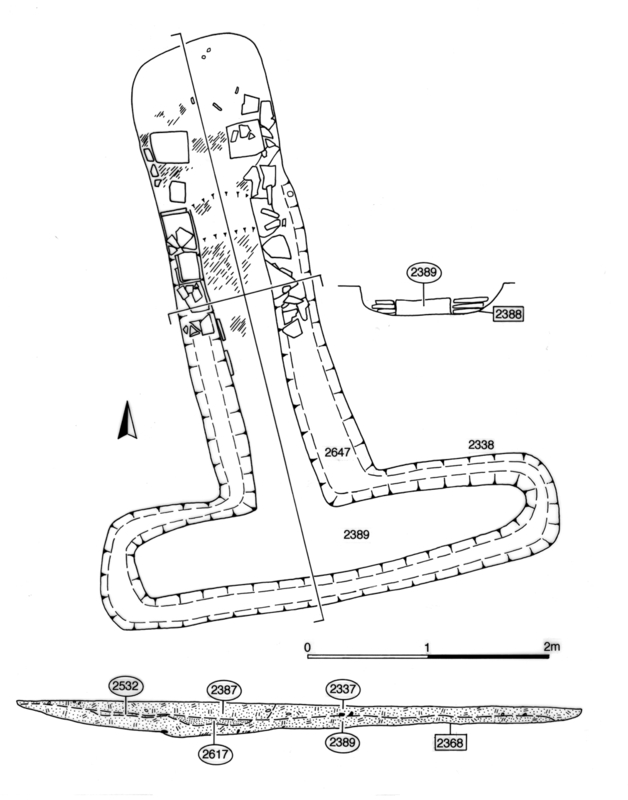 Foundation remains 2338 (Group 929) describe a classic T-shape, 3.9m long and 1.15m wide with a 2.7m-long bar across its 'top' (Figure 165). Although heavily truncated by ploughing, its cut survives to a depth of 0.15m and contains remnants of unbonded tile walls up to four courses deep. The majority of the walls are subsequently completely robbed and backfilled with silt and tile fragments (Group 930). Two complete tiles survive in situ at the north end, flanking the flue entrance and marking the position of a likely arch. The interior floor of the structure is lined with clay, on top of which lie charcoal-rich silty clays probably deriving from its use. No formal stoke-hole exists in front of the flue, but the structure entrance opens out onto the former position of prehistoric ditch 25203 and perhaps utilises its hollow. Later disuse/robbing of this structure is described in 'Northern hinterland west of Road 1'. Positioned on the edge of the upper terrace step, OA37 continues to contain little other than pits (Figure 163). However the number of pits present is reduced from that of preceding periods. Period 4 pits 55, 2103, 3507, 3736, 3737 (Group 913) generally contain relatively small and restricted assemblages of pottery and tile. Only pit 3736 has a more diverse range of artefacts that includes a silver denarius (SF184), a tile disc (SF177) and a fragment of Roman window glass. The interior of OA39 is void of all mid-Roman remains and is presumed to continue to function exclusively as a field (Figure 163).